By the time I got home I couldn't tell whether I got black (turtle?) 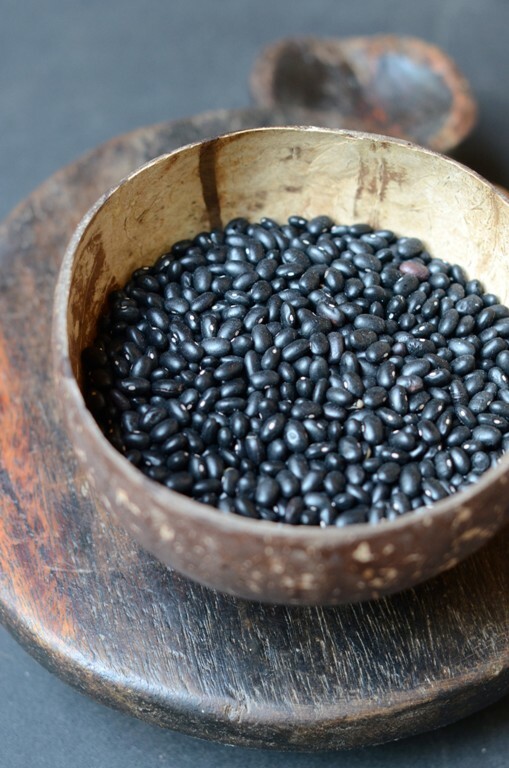 beans or black Adzuki (Azuki) beans. Can you tell the difference? Thanks for your help. Usually the adzuki is more squared off on the ends and has a larger hilum - or belly button. These are more football shaped with a tiny hilum, so I'll guess it's a New World phaseolus. They are SO tough to tell apart though, even though a completely different genus. Adzuki is a Vigna. Though now that I look at them again, they are a bit squared off on the end!! I didn't even know there was a difference. :) The photo is gorgeous. A lovely shot! Nice colors and props. Adzuki beans are very tiny in size.. smaller than the other variety of beans.. I think those beans are the first ones that u mentioned, not sure though. Beautiful photo - it really captures the essence of black beans - simple, wholesome, and alluring with their deep ebony black. Yum! TY guys. Turns out they are regular black beans. I went by WF bulk section to check. Just seem so small for regular but I will soak them overnight tonight and cook tomorrow and report back. Simply elegant. And such a fitting picture for one of my favorite foods. We eat black beans at least once a week. Thank you for sharing this stunning image, my friend!